78F350, Thank you for sharing! that was an interesting post, it seems that the more I read the more I found out that there is always something new to be learned. What did you do with the starter location for the 986 5 speed? 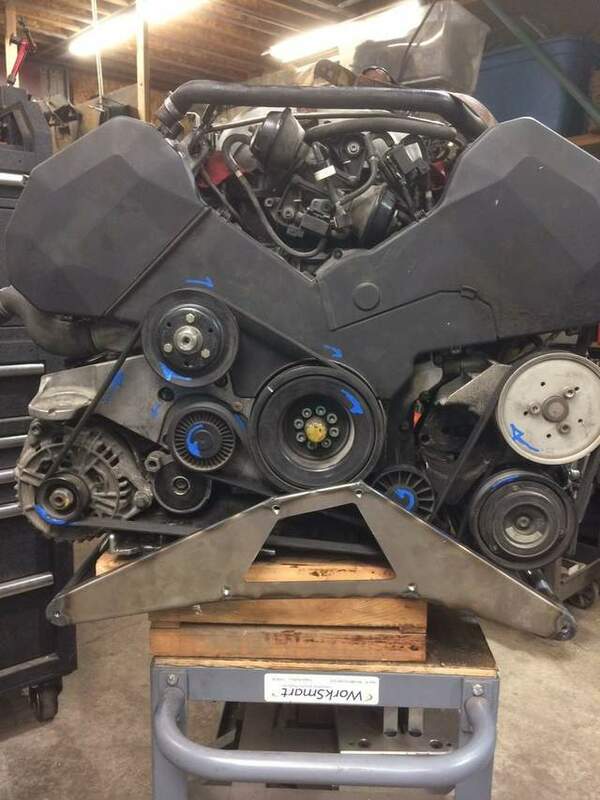 Here is a part I make for the early Acura NSX that may be helpful with these motor swaps, lots of folks buy these for many applications so figured I'd post it up here. ... What did you do with the starter location for the 986 5 speed? The 5 speed bolts right up with the Audi engine. No need to modify for the starter. The clutch slave from the 5 speed looks a little different, but both mount and seem to work identically. The shift cables and linkage need to be swapped with the 5 speed. The axle stub does not swap from the 6 speed to the 5 speed, so I'm using the whole 5 speed axle. It's just a bit short on the hub. I'm quite dissatisfied with my current cradle and I'm not a good welder. If you come up with one that you are willing to sell and ship, I'm probably going to want it. 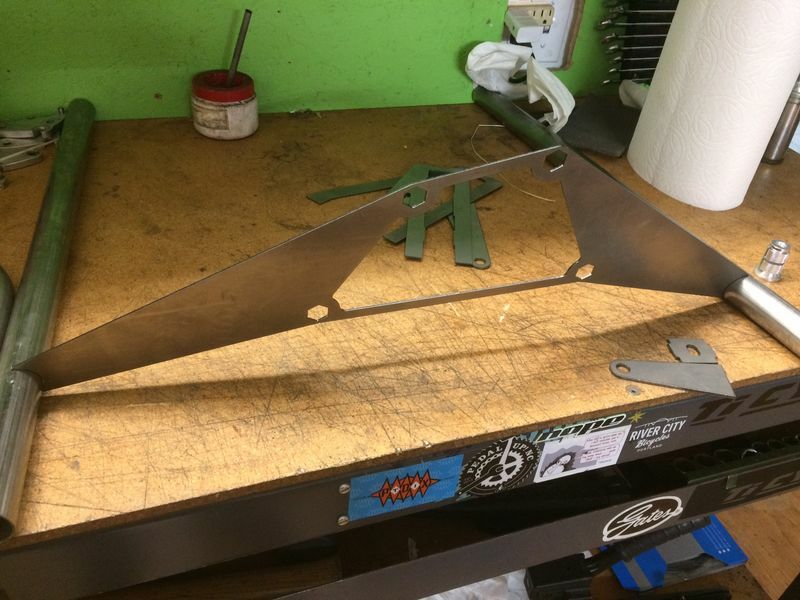 I gave a local fabricator measurements, the scrapped back 1/2 of a car, and this picture from Precision Chassis Works (for concept). After 2 months of "It will done next week" and about $1,000 I had a heavy piece of scrap metal that was off by INCHES. Finally got it to fit, but not well. I'd love to see what you come up with. 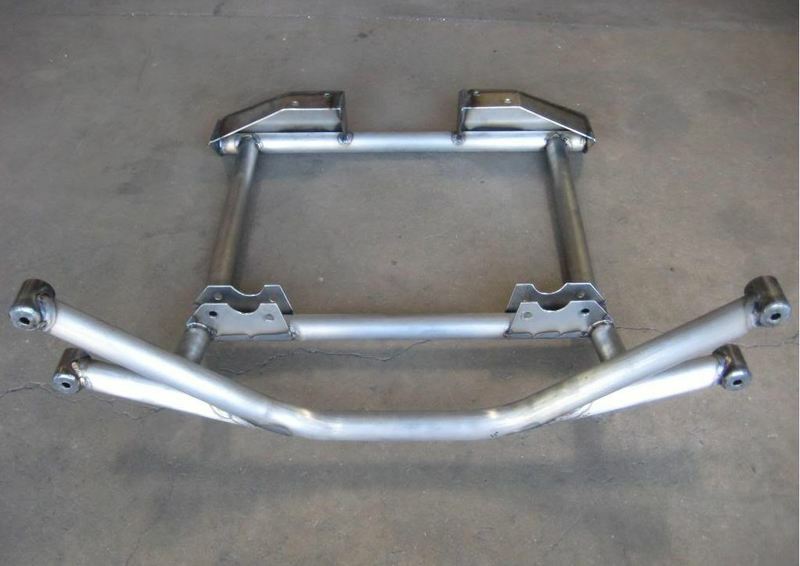 That layout is what I'm thinking for the cradle except with the Audi motor mounts so they can be a junk yard find, maybe add a torque link if it proves necessary, which I'm guessing it won't be needed for an NA build. For FI, seems like the drive line will be the weak link and my goal is a nice 300'/Lb torque from a motor we can track for a long time as long as no one money shifts it. is a cradle really needed? I am going with factory mounts as its only 100hp increase, that way you only need to fabricate an adapter to the front mount, I am going to modify the side mounts to allow a bit more exhaust clearance too, on the engine side I am removing the AC and PS pumps so mount bolts on there and then on the other side I am going to use the original Audi brace arm and also bolt through to the block in at least one place. I am using a GM astra electric power steering pump up front. Needed? Probably not. I am following the build on FB too and I think that is a good, innovative approach. I like it. Before seeing that I was already convinced that the cradle that KCPAZ came up with was the way I wanted to go. I respect his skills and see the design as 'track proven'. Nice solution if you don’t mind loosing the AC. What I want to make is a part that you can maintain all the creature comforts plus use the stock Audi mounts for the PS and AC since it looks like they will hose up to the Porsche systems with only the addition of a reservoir for the PS pump. I agree there is no need for more engine mount that the stock Boxster ones, really come down to packaging for me and it seems just as easy to make one cradle than 2 separate mounts once the design is finished. The other goal is a way to use either V6 or V8 on the same cradle with just a motor mount swap, or hole location change. 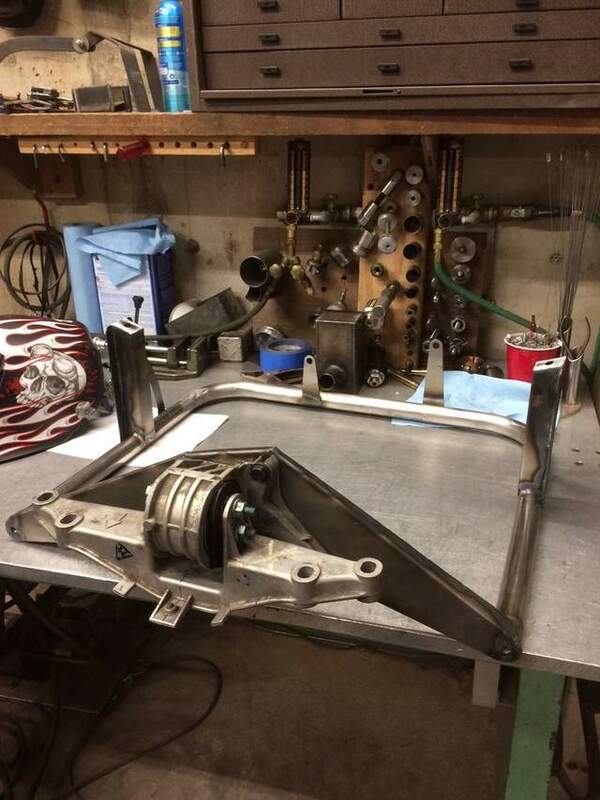 I think an advantage that the cradle has versus a singular front mount off the front of the engine is that the cradle can act as a stiffening member to better tie the bottom of the car together which may be helpful for the racers. 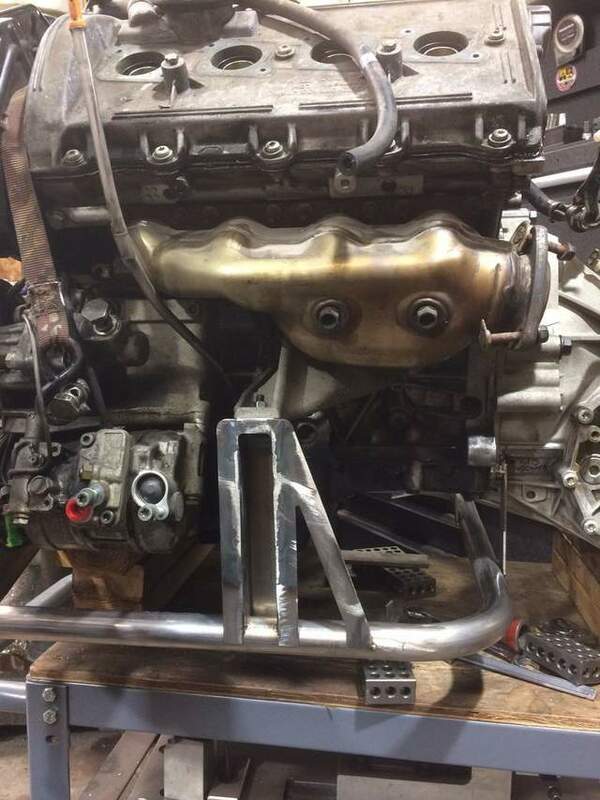 The guy in the FB build thread fabricated a small mount bracket that mimics the original flat-6 front engine mount, ie forward and lower from the crank pulley, which is also what I think rusty69911 is talking about too. That was the approach I was going to take because it seems to be the most simple and will offer lots of space on the side of the engine for future expansion. I will have an engine to start taking measurements from in a month or so. This looks like a very promising thread... lots of talent and skills. Can't wait to see how it progresses! What happens when one of these swaps hits the smog testing site? What will the ECU report to the OBD2 port connected testers? It will report the VIN from the originating car. Unless you re-code it via a hex editor. Now that I think of it, I'm not sure if it reports the engine type. I've been living away from smog for most of my life and really don't know the details of what is required. If the engine swap itself is legal, it should be able to pass a smog test if done correctly. I have learned the basics of flashing the ECUs used for these swaps and anyone else with very basic technical skills can learn it as well. It is not difficult to enter the correct VIN or load a modified file to the ECU. Knowing exactly what changes to make for tuning,.. or deleting the SAI is still beyond me, but the information is available for learning when my curiosity ventures there. With some adjustments, the ECU should function properly and OBD port report normally. Need to be sure? Have a reputable pro do it. Our current palm is to run 2 ECU, one for the car that shares outputs for the engine ECU that only controls the motor. The idea is to send just enough info to the car ECU that it thinks everything is good enough to run with out interference. For Oregon this will work for all cars prior to 2005 since there is not a need for ECU/VIN inspection, for later cars I am not sure how this will work if DEQ can 'see' both ECU plugged in. Last edited by titaniumdave; 12-19-2017 at 01:33 PM. 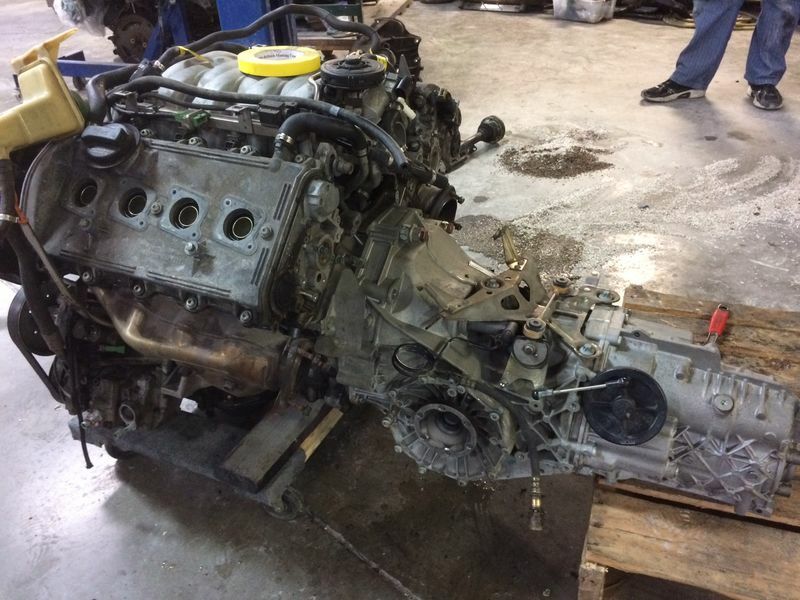 I just ordered a 987 6 speed transmission(with cables and axles) so I can get this project going, already have the 4.2L 40 valve motor. 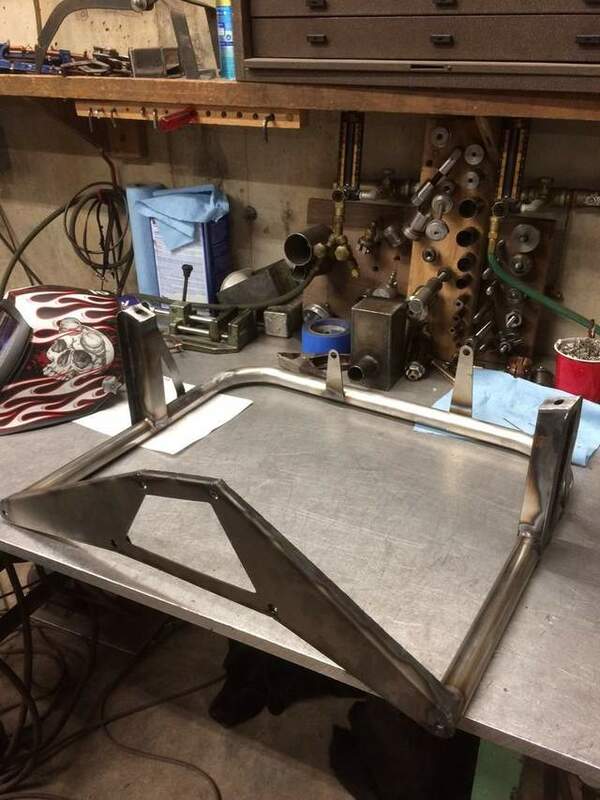 I'm going back and forth on the cradle design, using the front Boxster mount makes packaging easy and will simplify the front radiator line routing. Thinking this route will be a horse shoe shape that will pick up the motor in 2 locations on each side, at the transmission bolt up and the factory Audi motor mount location. This way all the bending moment is compensated for and the load is stabilized into a plane that can bolt up to the stock front Boxster mount. Front could be a flat plate to make it compact and help with packaging for accessories/belt run. Hopefully I can have pics of concept next week...depending on how the holiday messes with things. 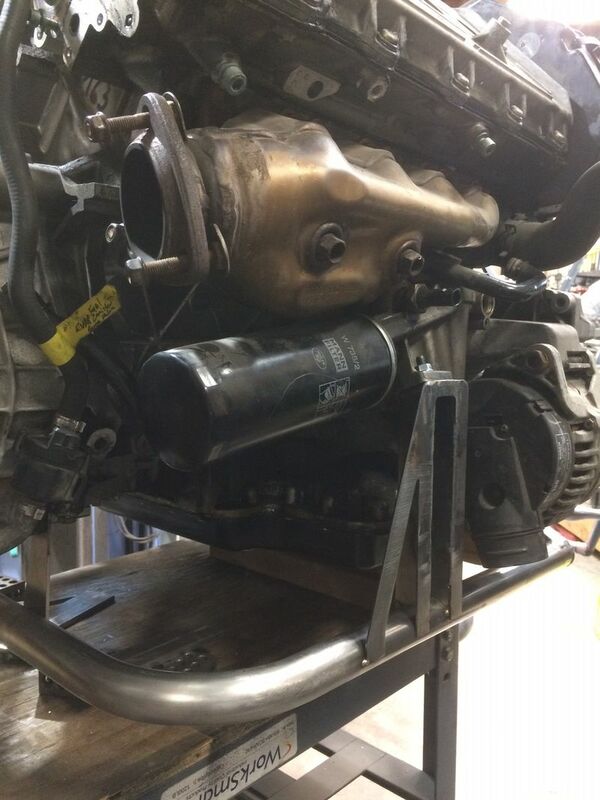 A little progress, the engine cradle in the next couple of weeks! 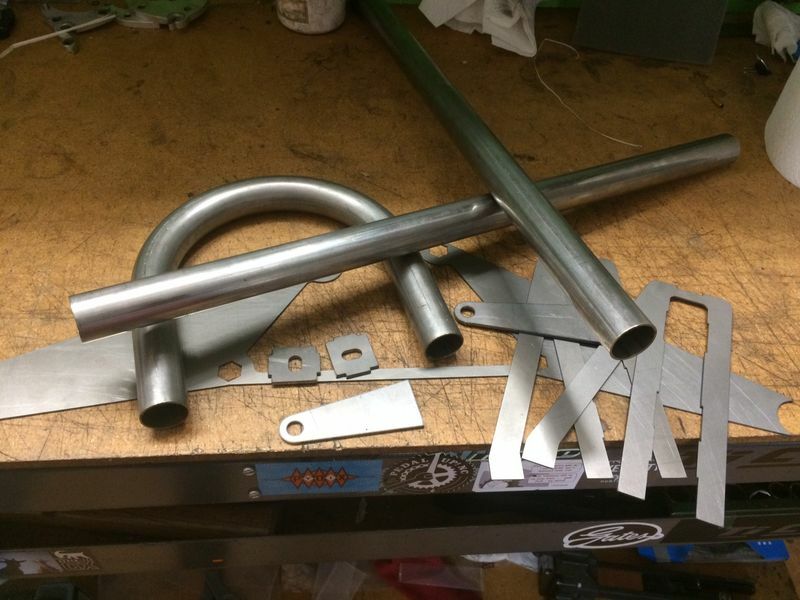 Some of the parts for the motor cradle...hopefully get the rest tomorrow and can have it welded up this weekend! Can you make me one too please? Once I get one done and I'm sure it works the plan is to offer these for sale. Also make one for 2.7L V6 too for those who want to do the turbo thing! I should have this together this weekend and if I got it right. Cradle welded...next step to see if the motor fits in the car. Complete cradle is 8.5LB, I might have made it too light but it's surprisingly stout feeling, real question is fatigue over the long haul. An extra couple of pounds will most likely make sense.